August 29, 2015 (San Antonio, Texas)-A tremendous set of bucking bulls assembled at Cowboys Dancehall in San Antonio in order to match up with some of the best bull riders in the world. Five cowboys were able to make it to the eight second whistle, but international rider, Jorge Valdiviezo came out on top-winning first and third place with his two entries. Lane Nobles, of China Spring, Texas, continued his hot streak with a second place finish. National Finals Rodeo qualifier Cooper Davis rounded out the “paying places” with his 83.5 point ride for fourth place. 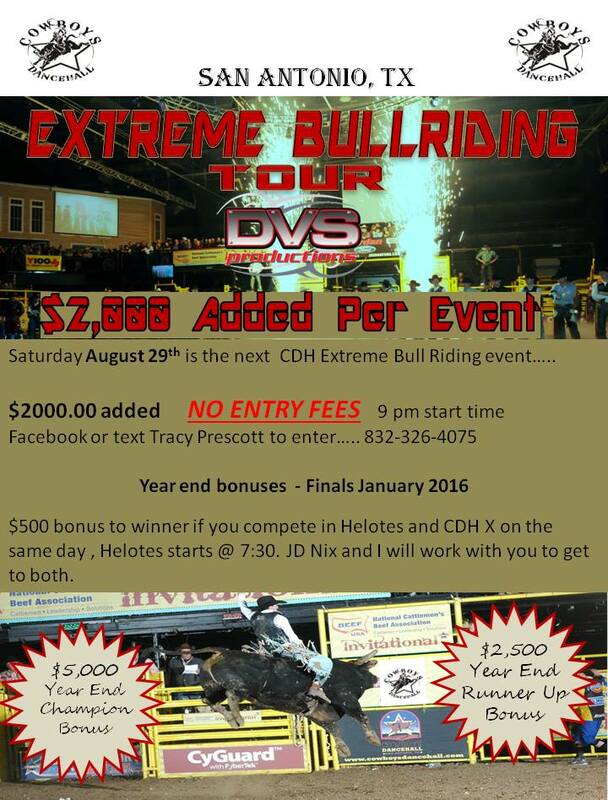 This entry was posted in DVS Productions and tagged bull, bull rider, Bull Riding, Cowboy, cowboys dancehall, iroc, PBR, prca, rank, rockin' I, Rodeo, saxon beck, tadpole beck. Bookmark the permalink.